Just two degrees with a biting wind. Not a great day for moving but my brother didn’t get to pick the weather. 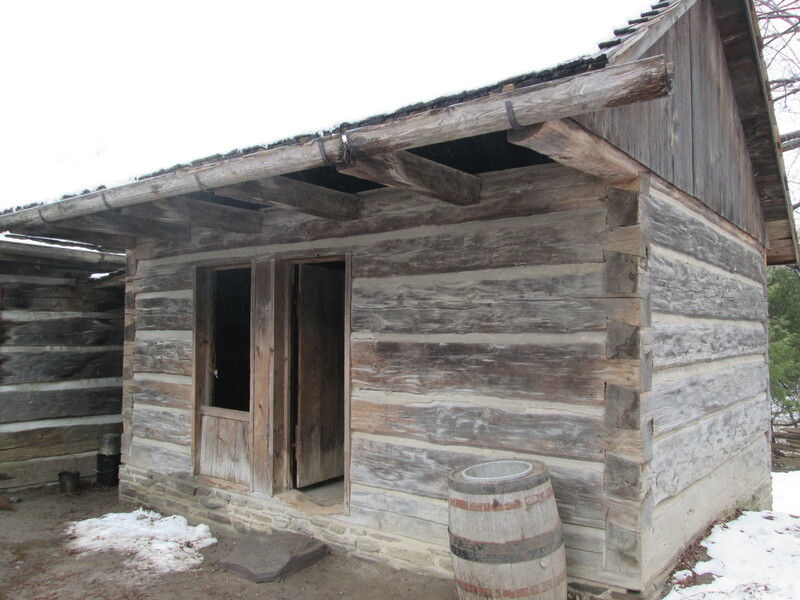 He had been living in the former town of Dixie on property that once belonged to Joseph Silverthorne who was the founder of the town. Joseph’s house, known as Cherry Hill house, was featured during the exploration of Summerville. A break from moving is a great opportunity to explore and so we set out for the Dixie Union Chapel. 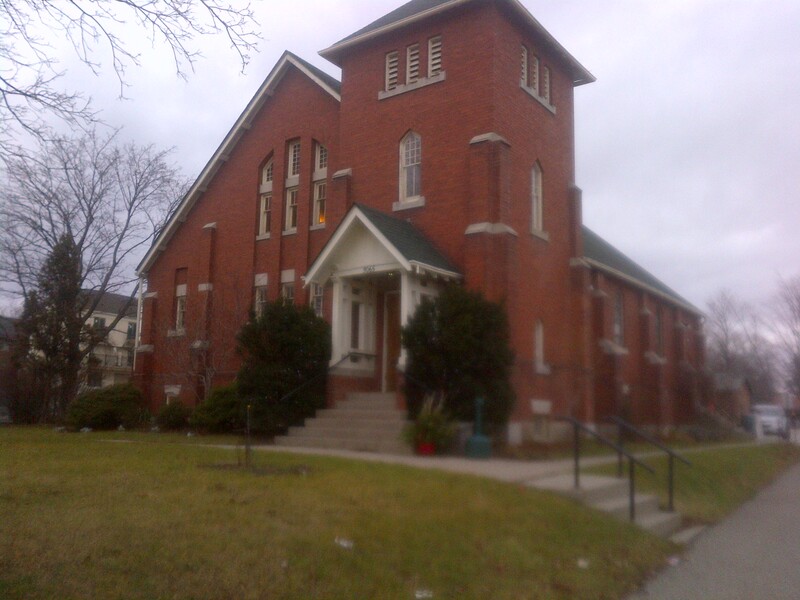 Dixie Union is the oldest surviving union chapel in Canada. Early settlers in the Dixie area were too few in numbers to be able to afford to build their own churches. The solution was for several denominations to go together and build a union chapel that they all could use. Eventually congregations would grow and get their own churches, as happened here. In Dixie the Anglicans, Methodists and Presbyterians got together and built Dixie Union Chapel. 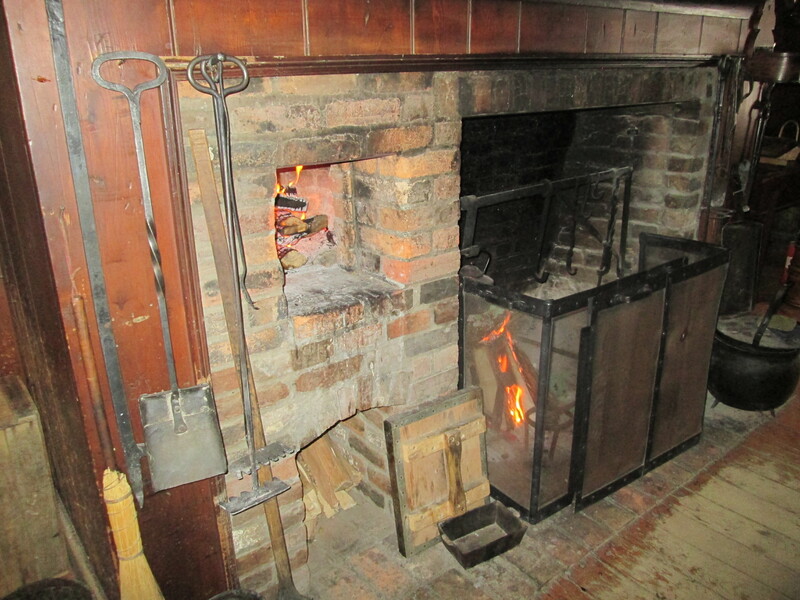 The first chapel was a log one which was started in 1811. The war of 1812 interrupted construction and it was not finished until 1816. 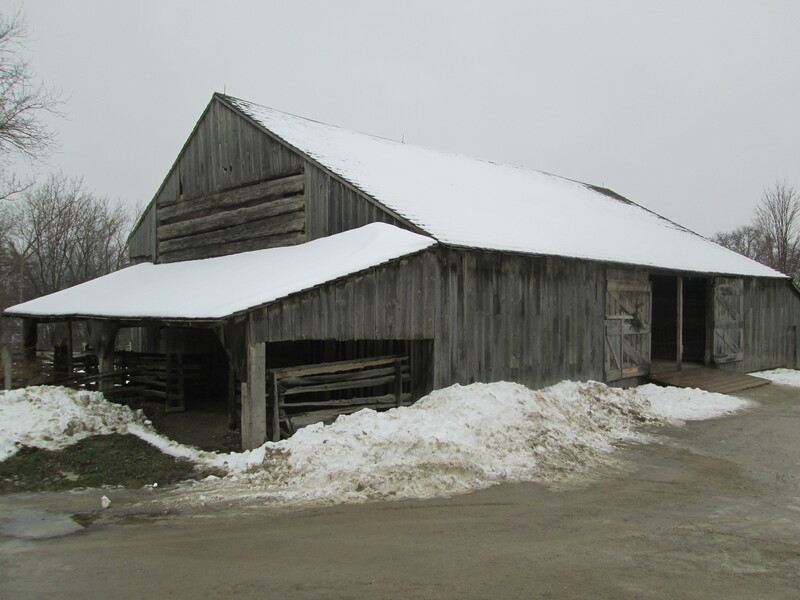 In 1837 the project of hauling stone from the Etobicoke creek was begun in preparation for construction of a new building. 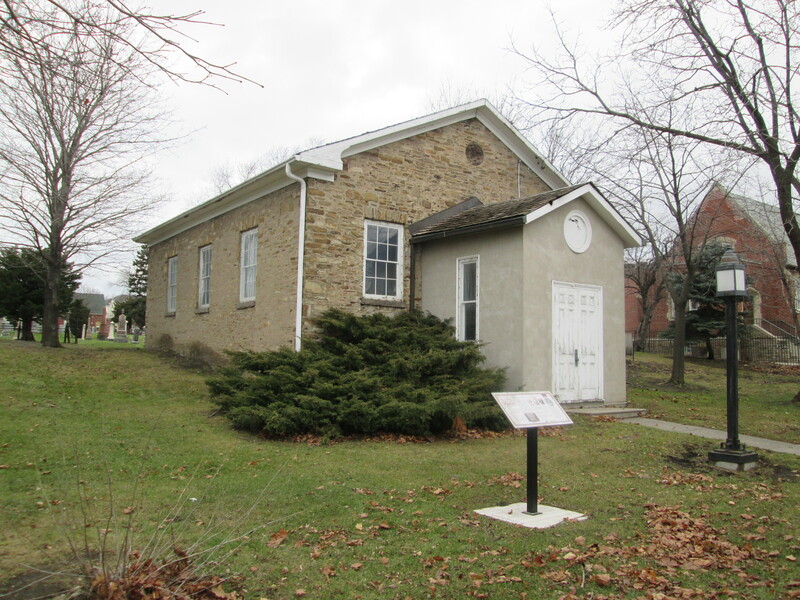 There is some suggestion that Silverthorne’s mill was taken down around this time and the stone may have been recycled in the present chapel. 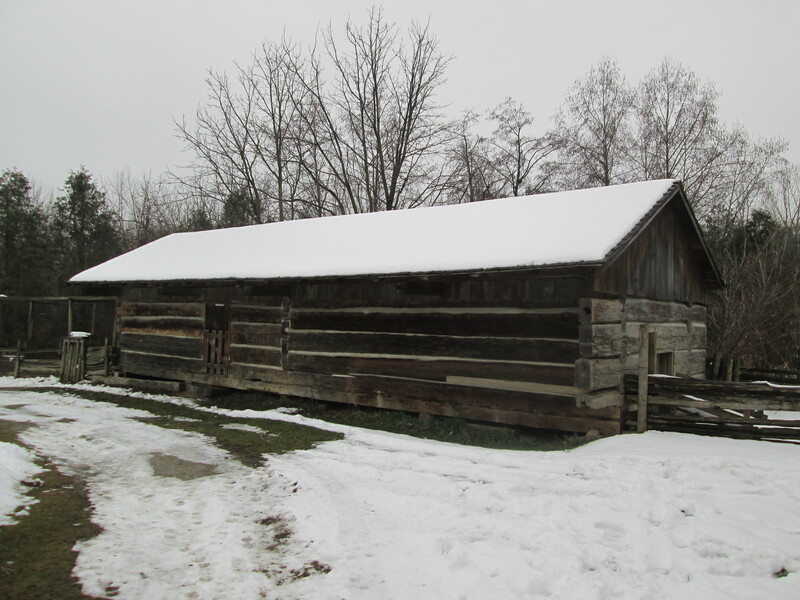 Like the earlier log building the Stone Chapel, (as it was also known) suffered a delay in construction. This time due to the Rebellion of 1837. There is a wooden clock in the front of the church just below the roofline. The cover picture shows the time as 11:02 and it is dated at the bottom with 1837. 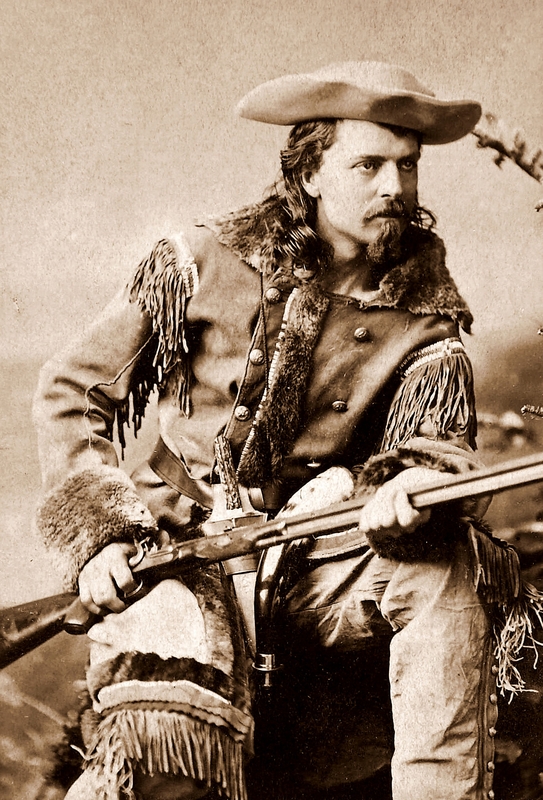 Buffalo Bill Cody was famous for his travelling show which presented the old west. He got his nick name “Buffalo” because of a contract he had in which he sold buffalo meat to the Kansas City Railroad workers. American Bison is the correct name for what is often called buffalo. Cody is reported to have killed 4,282 bison in an 18 month period. A brief write up about bison is included in the previous post High Park – Zoo. The Cody family were the first settlers in what became Dixie and donated the land for the church. Buffalo Bill Cody was baptized there in 1847. 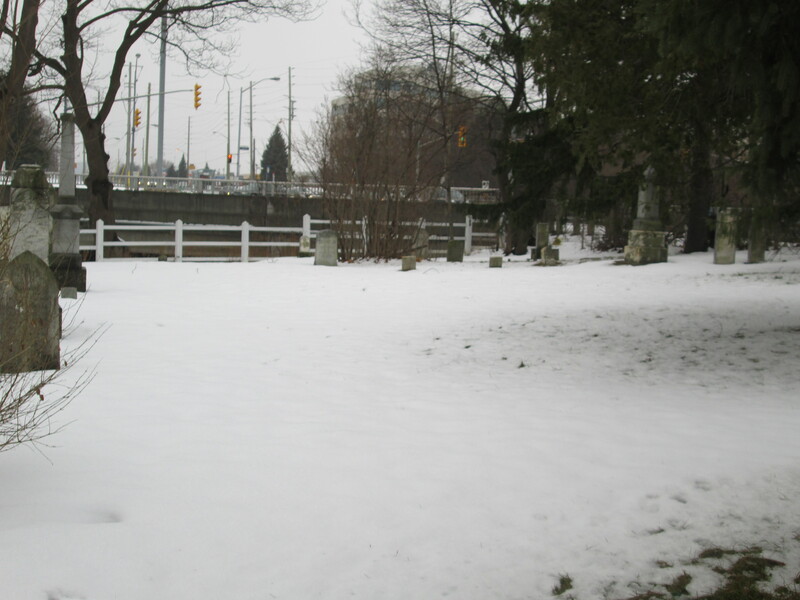 This is the only graveyard in Mississauga that existed prior to the war of 1812. There are six known burials of militiamen who served in that conflict. 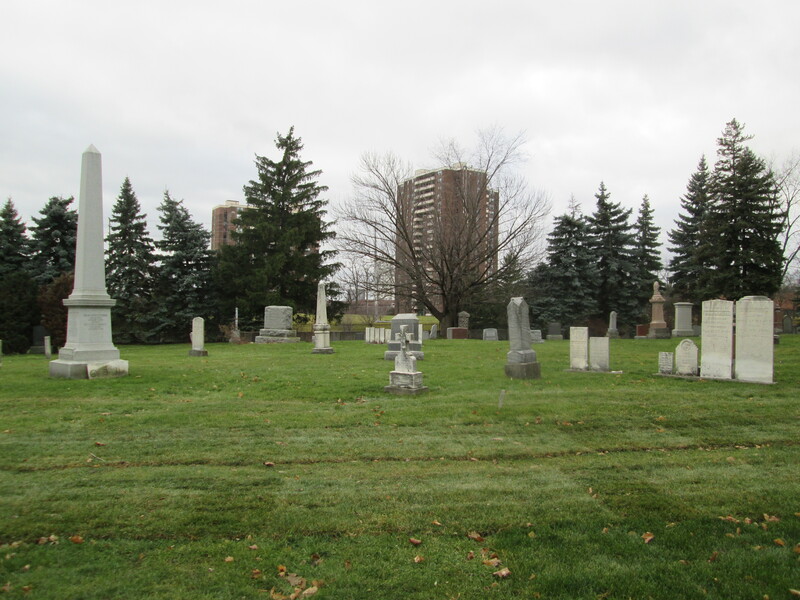 Some older tombstones here run at a 45 degree angle to the general grid pattern of the grave markers. These “angled” ones run with their feet facing the east to allow the dead to rise facing the dawn on judgement day. 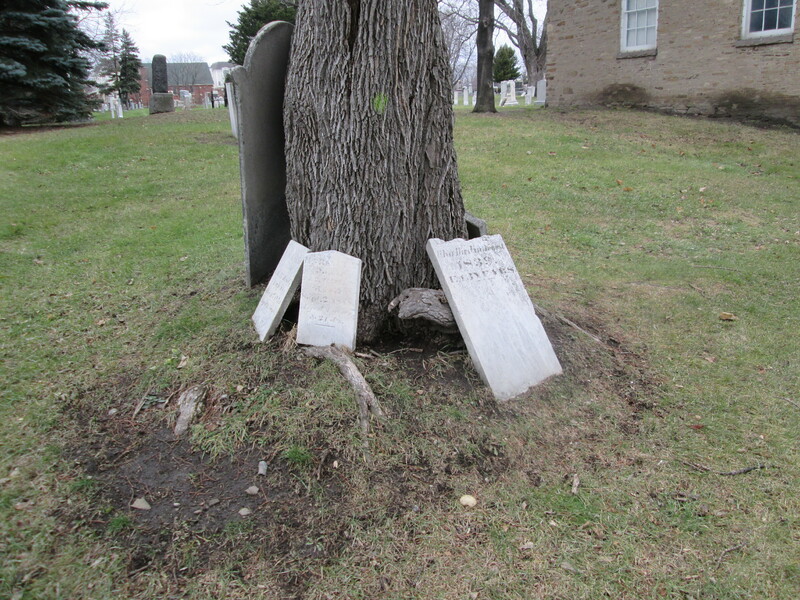 Other denominations tend to have their tombstones run parallel to the property lines. As this is a union cemetery there is a mix of these two traditions making this rather unique. In the picture below the tall marker on the left is for the Silverthorne family, including Joseph. The two white stones on the right, along with the four shorter ones to their left, are angled facing east. 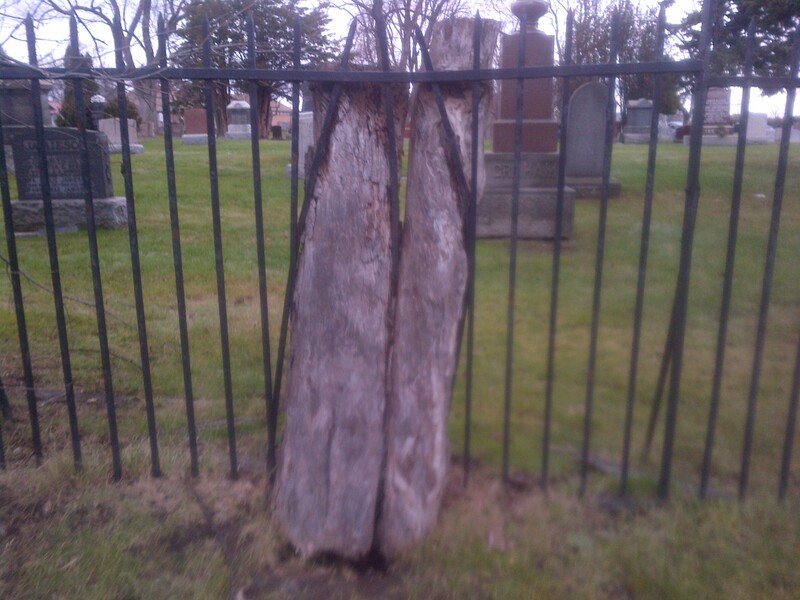 Unfortunately the weather and possibly vandals have taken their toll on the older stones in this cemetery. Many of them are broken off and are leaning against trees, fences and the chapel itself. This tree looks like it tried to escape by bending the bars on the fence. Some day the trunks will rot and drop out of the fence leaving people to wonder how the wrought iron got bent like that. 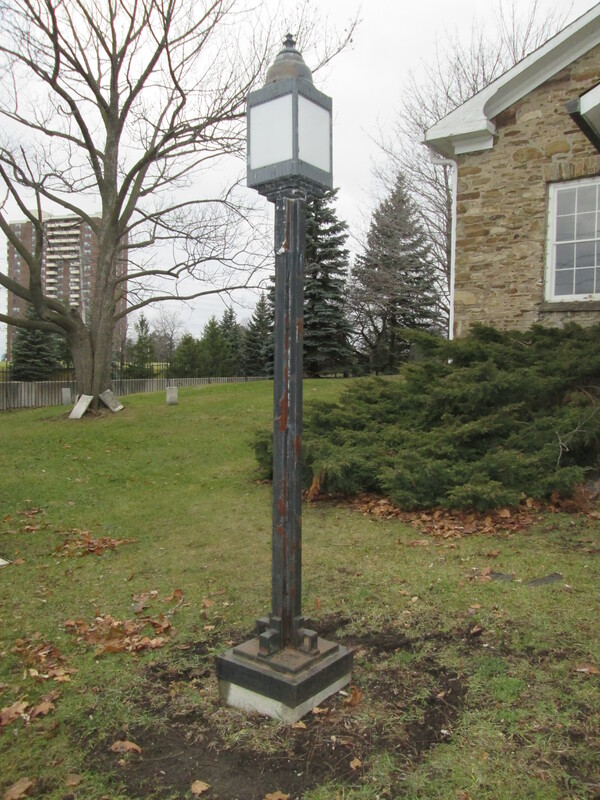 The old steel lamp posts at the front of the building would have been forged by the local blacksmith. Having three congregations in the building pretty much guaranteed the services, usually volunteered, of most tradesmen. 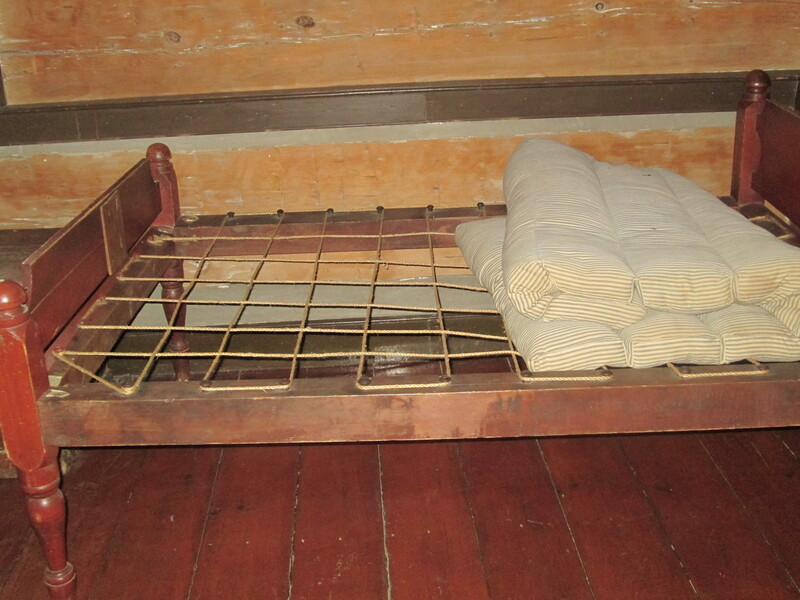 This kept the cost of building and repairs to a minimum. Today lamps like this are back in style and can be bought by the container load from China. In 1870 the Anglicans built a brick church just to the east of the Dixie Union Chapel which they called St. John The Baptist. It was remodeled in 1922 but was destroyed by fire after a lightning strike in 1925. The church was reconstructed in a similar style as the 1870 building. The Presbyterian congregation erected their own building at the north end of the cemetery in 1910. This building now serves a similar function to the old Dixie Union Chapel. According to the sign out front it also hosts a Korean Methodist and an Eastern Orthodox Congregation. That’s all for 2014. It was a year full of adventure, exercise and investigation. I loved it all. Happy New Year everyone and here’s to some great hiking in 2015! 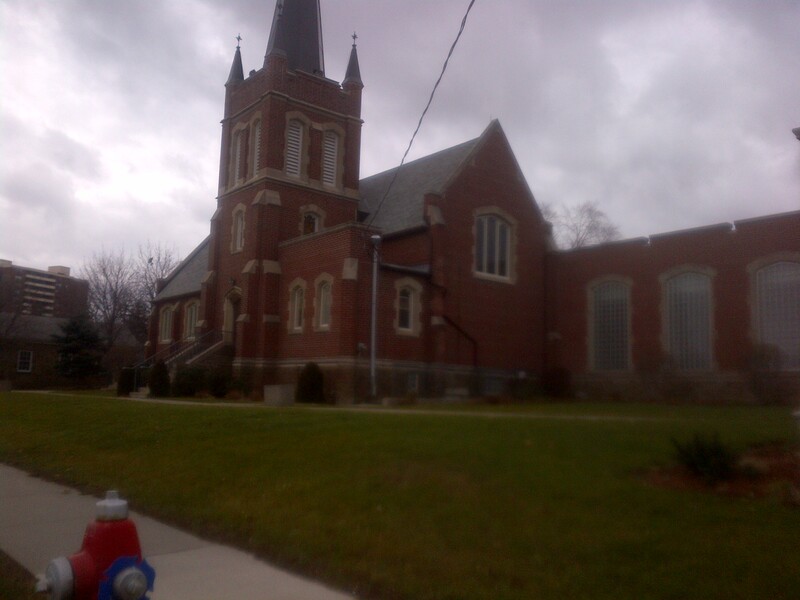 This entry was posted in Uncategorized and tagged Buffalo Bill, Dixie Union Chapel, John Silverthorne, rise facing east on December 30, 2014 by hikingthegta. Following Queen Victoria’s coronation in 1837 Lot Street was renamed Queen Street. 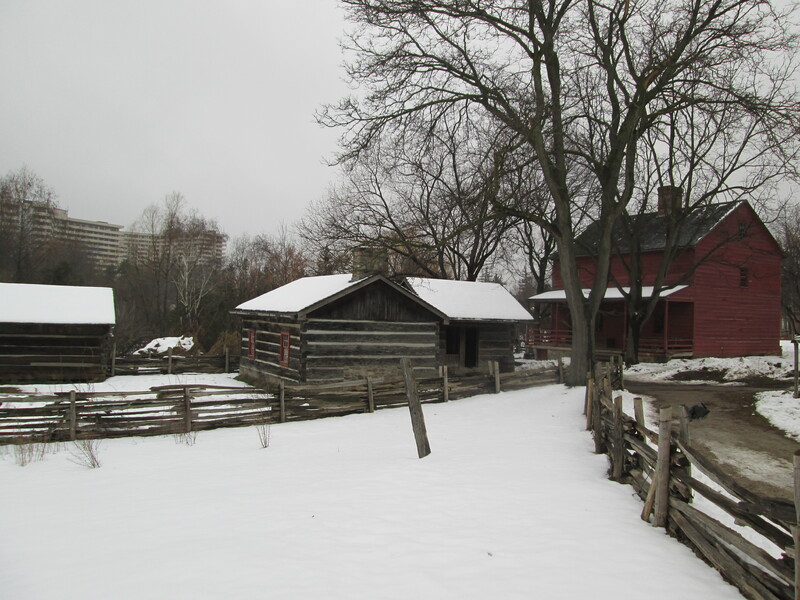 The original name Lot Street was due to it’s use as the base line for the land survey in the town of York (Toronto). William Warren Baldwin bought a 200 acre land grant running north from Lot Street. He named his estate Spadina after the native word for hill or sudden rise of land. This rise of land is part of an ancient shoreline from when Lake Ontario was larger and known as Lake Iroquois. The Scarborough Bluffs are also part of this shoreline. Here he built the first Spadina house in 1818 and laid out Spadina Avenue to link it to the city. 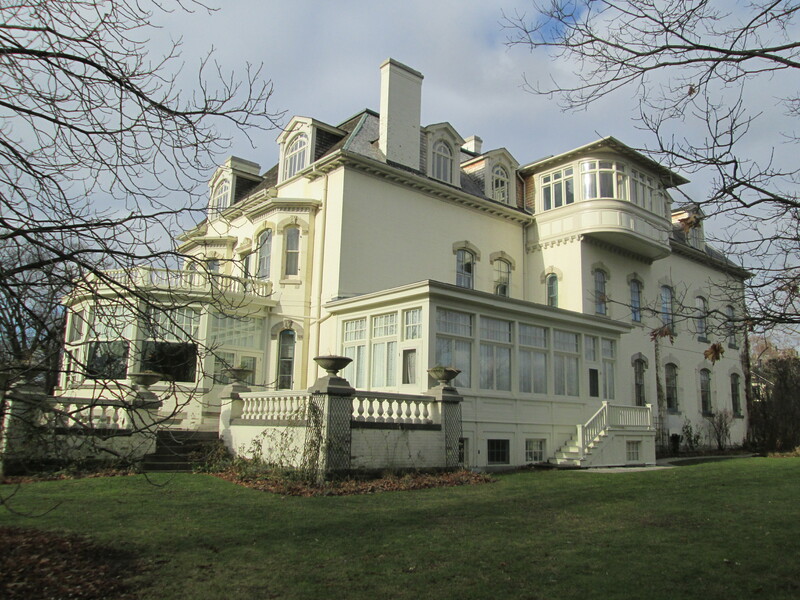 He set a trend for York’s wealthy to establish large estates along the crest of the bluffs overlooking Davenport Road. This became the wealthiest neighbourhood in the city by 1900. Baldwin and his son, Robert, are credited with bringing government reform to Canada. While the Rebellion of 1837 failed to overthrow the Family Compact that was running the government, the Baldwins worked within the system to bring about change. 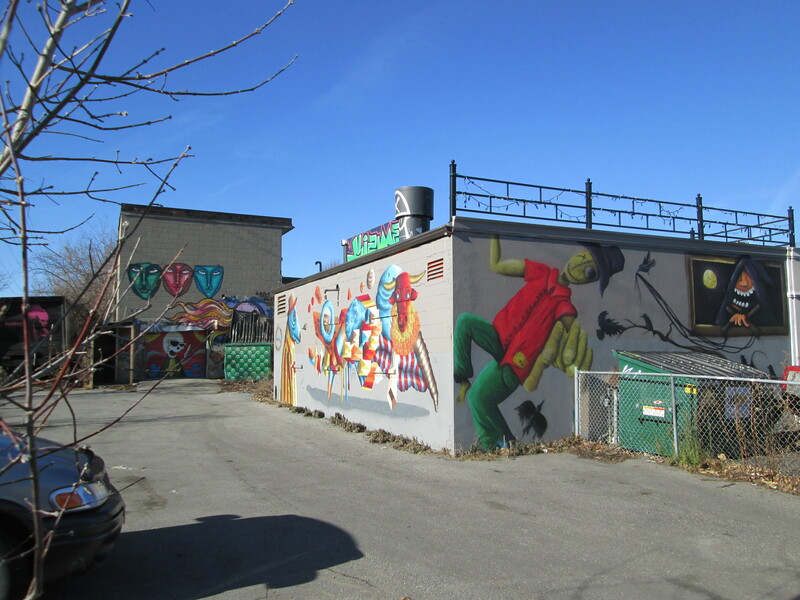 The former Spadina estate with it’s various modern uses was the subject of today’s exploration. It is marked in red on the 1877 county atlas below. The sun was shining and it was a couple of degrees above freezing as I parked on Spadina just north of St. Clair. 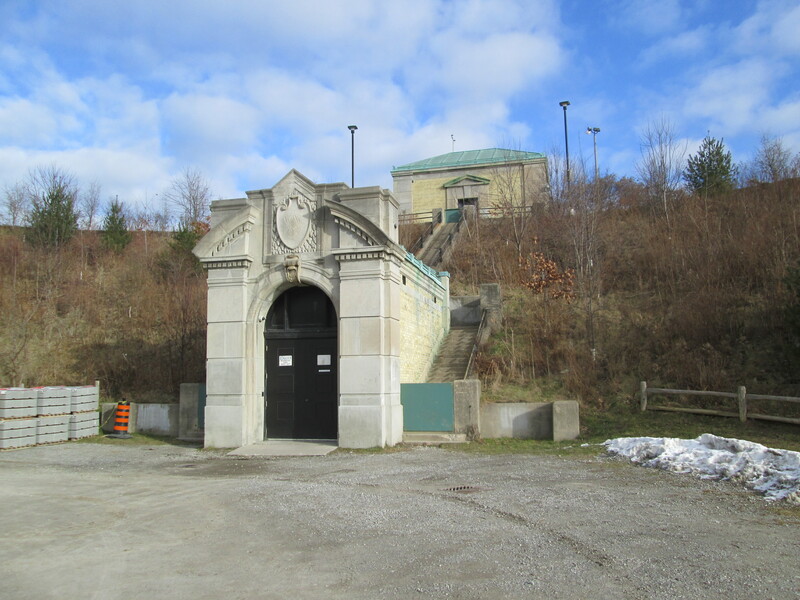 The St. Clair reservoir is located on the south east corner on property that was sold to the city in 1913. The reservoir was part of a larger project of public works planned and developed by R. C. Harris in the 1920’s. The R.C. 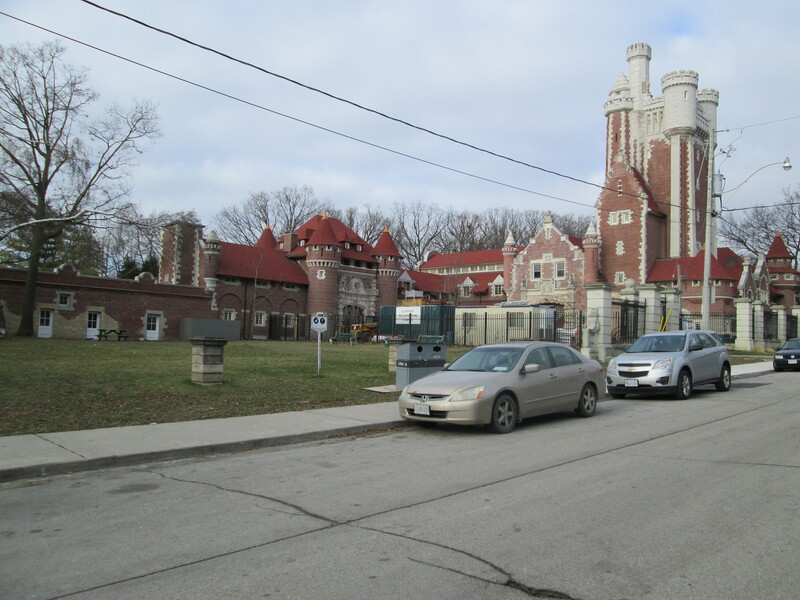 Harris Filtration Plant on Victoria Park was the first part of the Water Works system to be built. 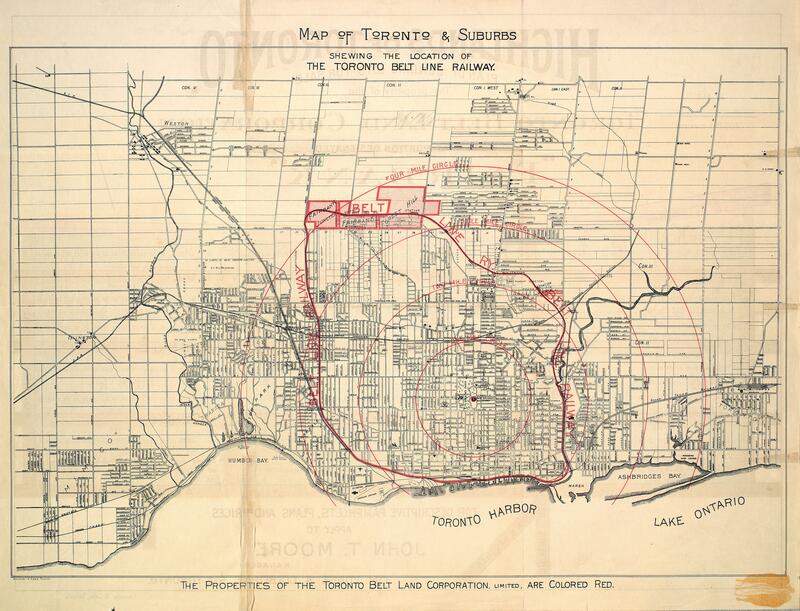 After the Lake Ontario water had been purified it was pumped to reservoirs throughout the city for storage and delivery. The reservoir at St. Clair was the first to be completed in 1930. 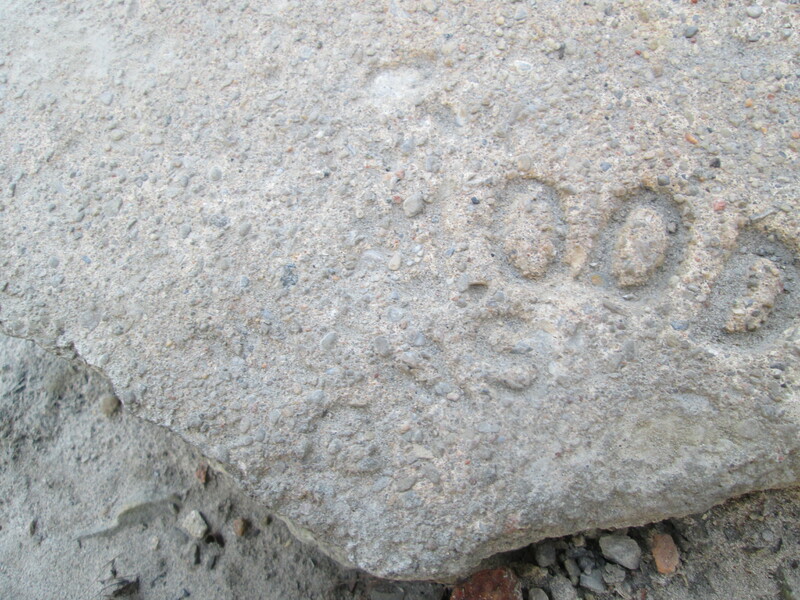 The cover photo shows the date stone with it’s inscription TWW (Toronto Water Works) and MCMXXX (1930). The picture below shows the valve house at the top of the reservoir and the pipe tunnel portal below. A grand staircase climbs the reservoir between them. When the reservoir was designed there was a fear that power failures could cause loss of water to the homes north of the reservoir. Harris envisioned a water tower that would provide a 30 minute supply of water to homes in district 3. The steel water tower would have cost $43,000 but Harris also designed a $70,000 neo-classical cladding for the outside to match with the pump houses. With the great depression deepening city council didn’t approve the water tower. Harris built the foundations for the water tower in the hopes that it would later get approved. Improvements in the delivery of electrical power made the water tower obsolete and in the end it was never built. 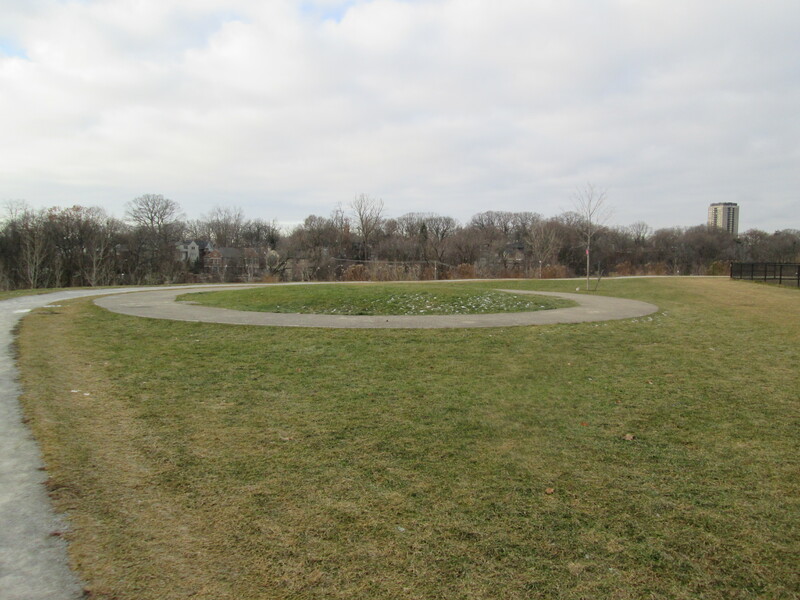 On the south corner of the reservoir there is a mysterious concrete circle, the foundations for the planned water tower. The reservoir overlooks Nordheimer Ravine. Samuel Nordehimer emigrated to Canada from Bavaria in 1844. Along with his brother Abraham they opened a piano factory in The Junction. A & S Nordheimer became one of Canada’s best known piano manufacturers. Castle Frank Brook flows through the ravine on it’s way to join the Don River. Castle Frank Brook is named after the home of Lieutenant-Governor John Graves Simcoe and his wife Elizabeth. Constructed in 1793, Castle Frank was the first of many grand estates built north of the town of York. 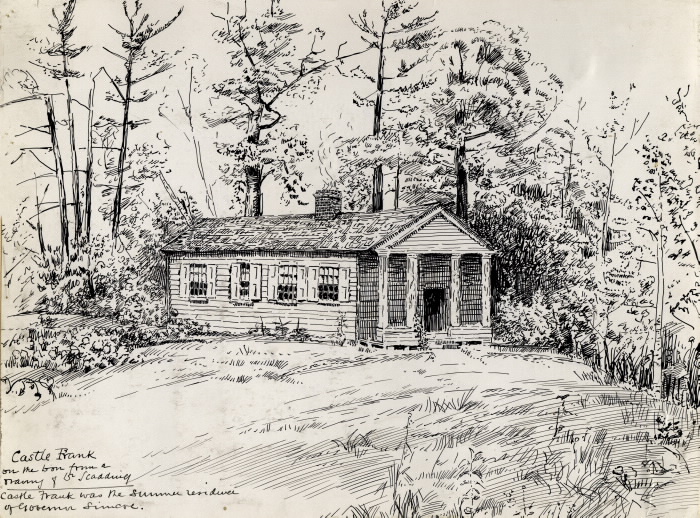 The sketch below shows what the home of the Simcoes looked like. Castle Frank Brook was buried in the 1970’s when the Spadina subway line was extended. It now flows through a sewer pipe under the ravine. 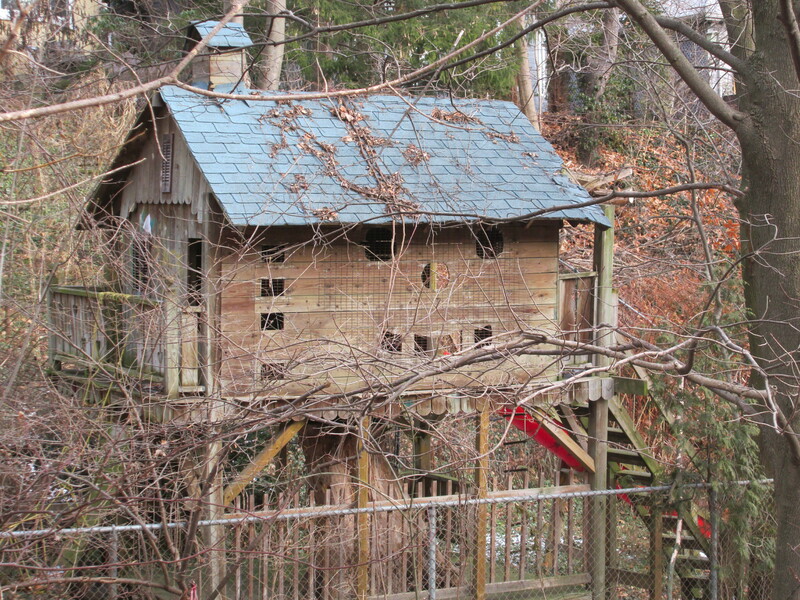 As I walked along the ravine I saw a rather unique tree house. This one has a smiley face cut in the side for windows. Soil erosion on the hillsides has left a lot of tree roots exposed. The root system of a plant is normally close enough to the surface to take advantage of nutrient and water availability. However, where water is scarce, roots have been known to extend over 60 meters into the ground. The bridge across Nordheimer ravine was built in 1929 as part of the infrastructure improvements that went along with construction of the reservoir. 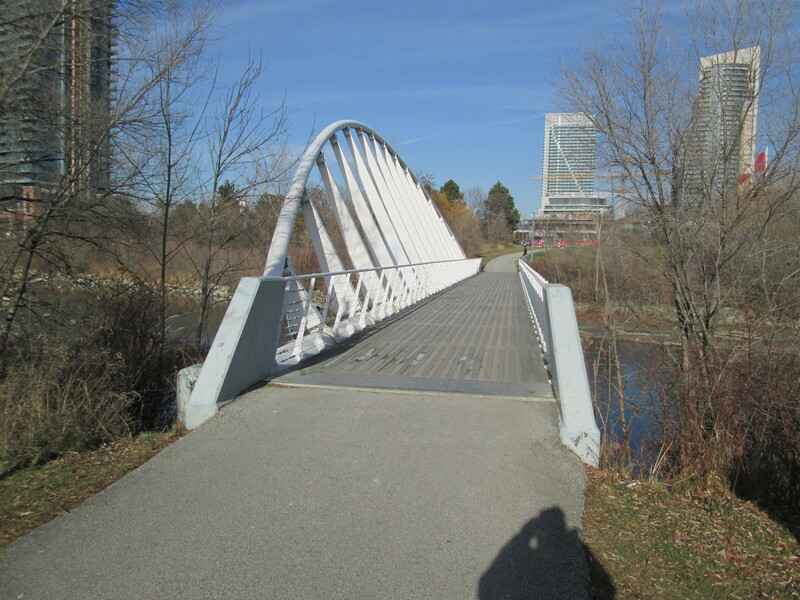 An earlier wooden bridge was replaced with the current one which is modeled after the Bloor Street Viaduct, also built by R.C. Harris. Crossing the bridge and continuing south you quickly come to the edge of an old escarpment looking out across the downtown core of the city. 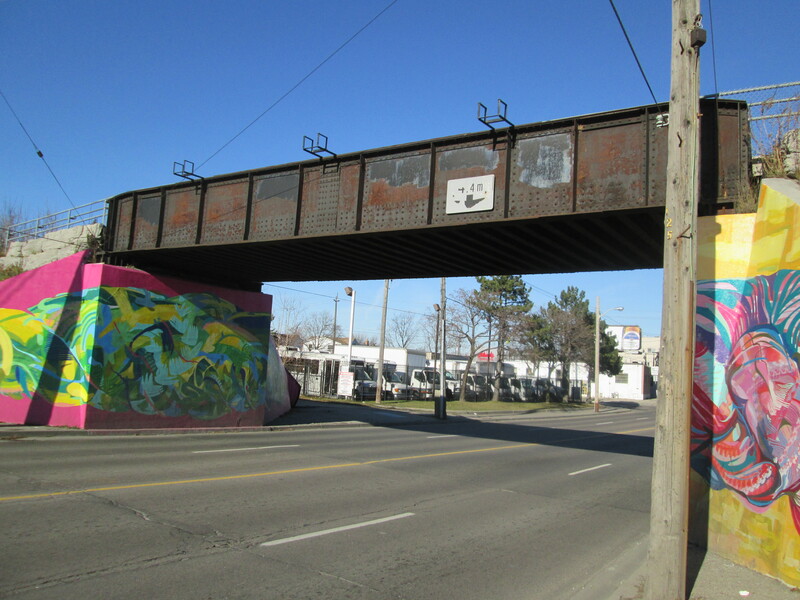 Spadina Road was designed as a grand thoroughfare between Queen Street and Davenport Road. 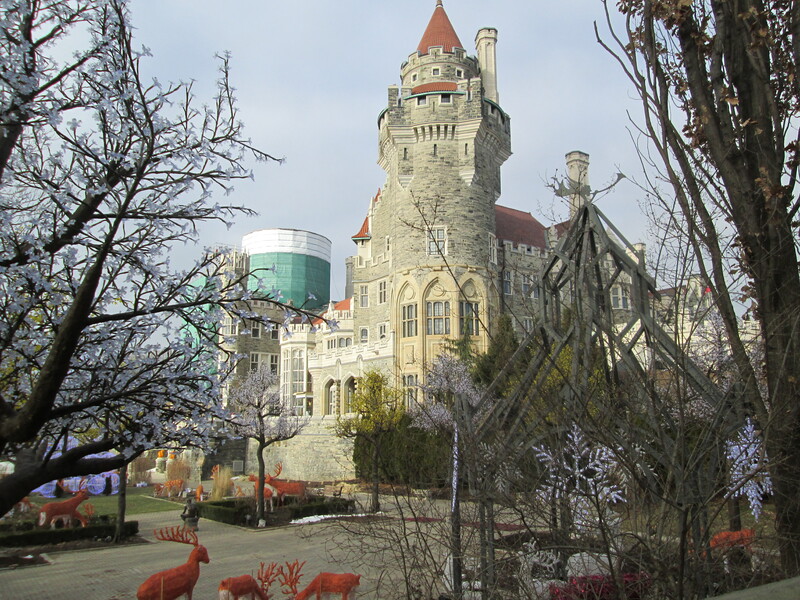 With 98 rooms the largest private home ever built in Canada is Casa Loma. It was constructed between 1911 and 1913 for Henry Pellatt. Henry had made his fortune by developing Niagara Falls for electrical production and bringing hydro to the city of Toronto. 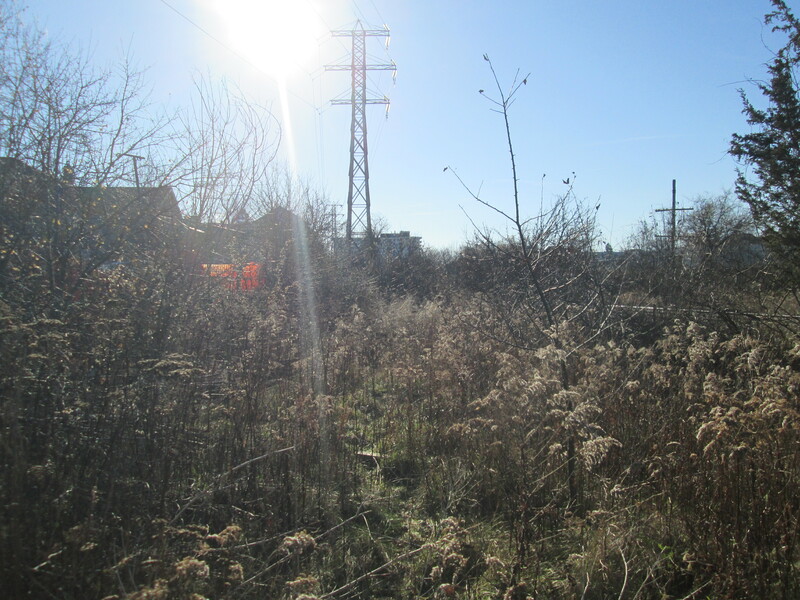 We had found the remnants of his power corridor while hiking Humber Bay to Bloor Street on May 24. The front lawn was laid out for Christmas. When Pellatt was envisioning Casa Loma he was also thinking about his horses. He had elegant stables built in 1905 in anticipation of building his castle. He lived here while the castle was under construction. There was an 800 foot tunnel built underground from the stables to Casa Loma. During the second world war a top secret installation here assembled ASDIC, an early version of sonar that was to prove key in winning the war in the Atlantic. 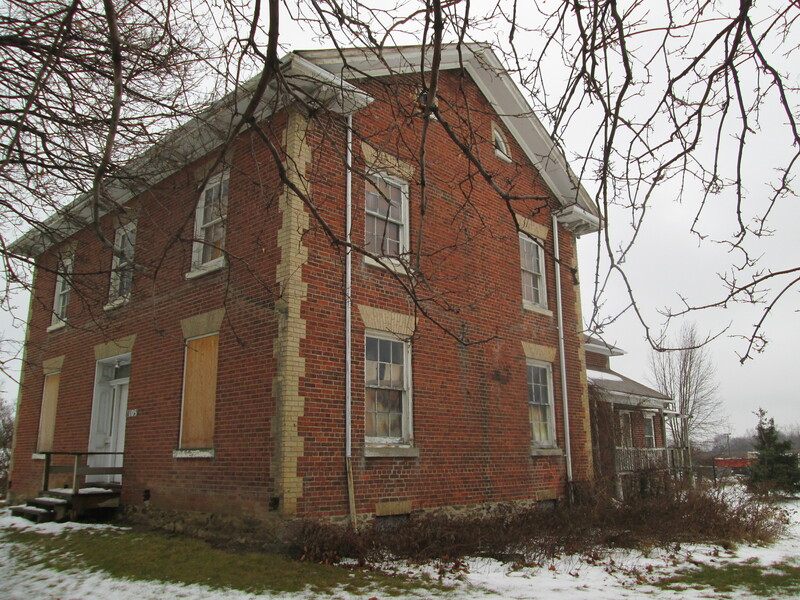 William Warren Baldwin built the third house to stand on the Spadina property in 1866 completing it in 1913. Spadina house was donated to the city in 1982 and opened as a museum in 1984. 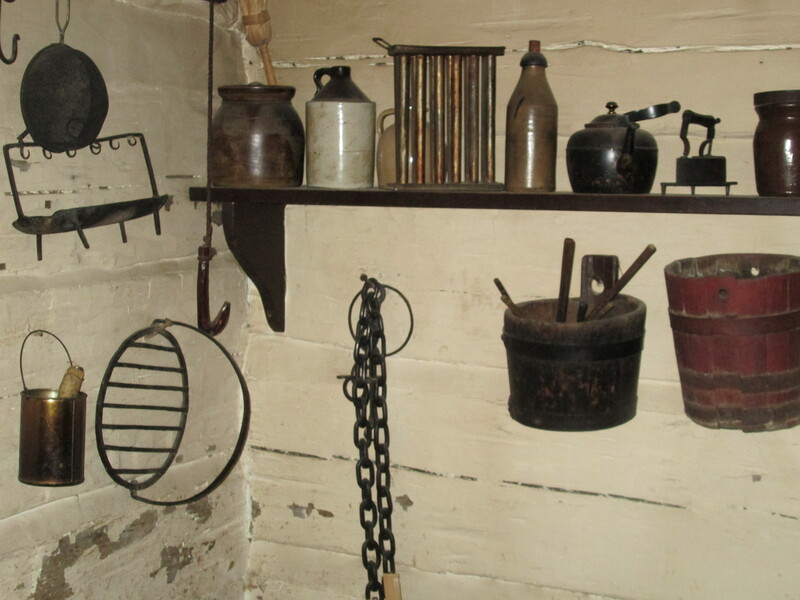 It has been decorated to showcase life in the 1920’s. While exploring Earl Bales Park on July 19th an old water pump made by R. McDougall & Co. in Galt was found in the woods. 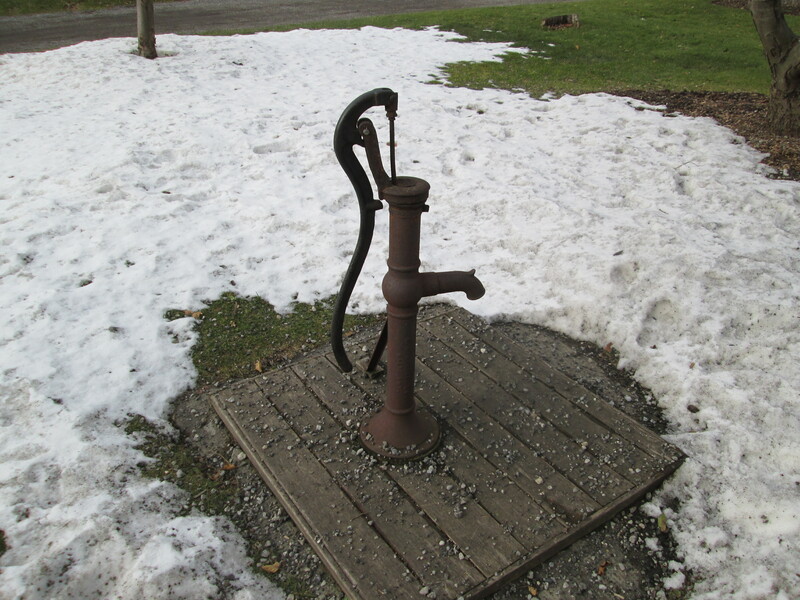 One of their water pumps was installed at Spadina house where it served the needs of the house for several decades. A set of gardens is laid out in the back of the house similar to the 1905 gardens. A smaller garden near the house grows plants that would have been cultivated there in 1880. 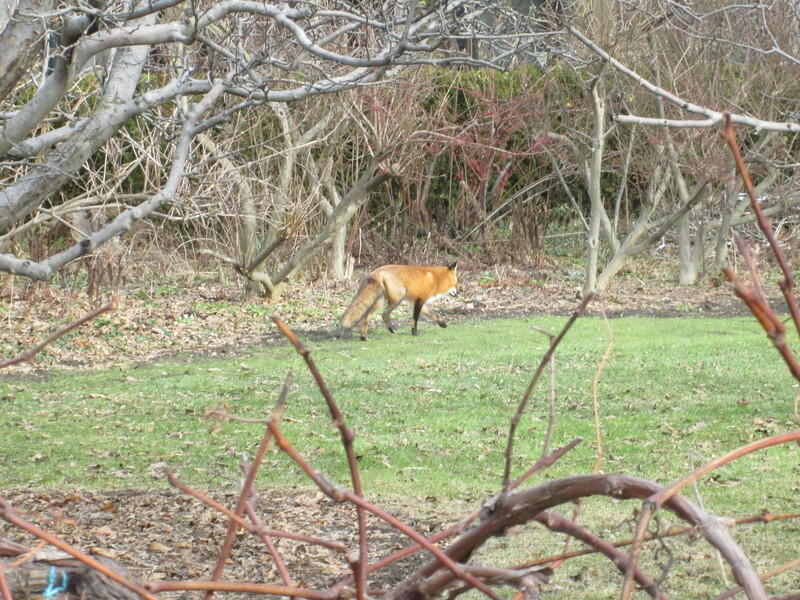 After having walked once around the rear gardens of the home I returned to find a red fox walking across the front lawn. 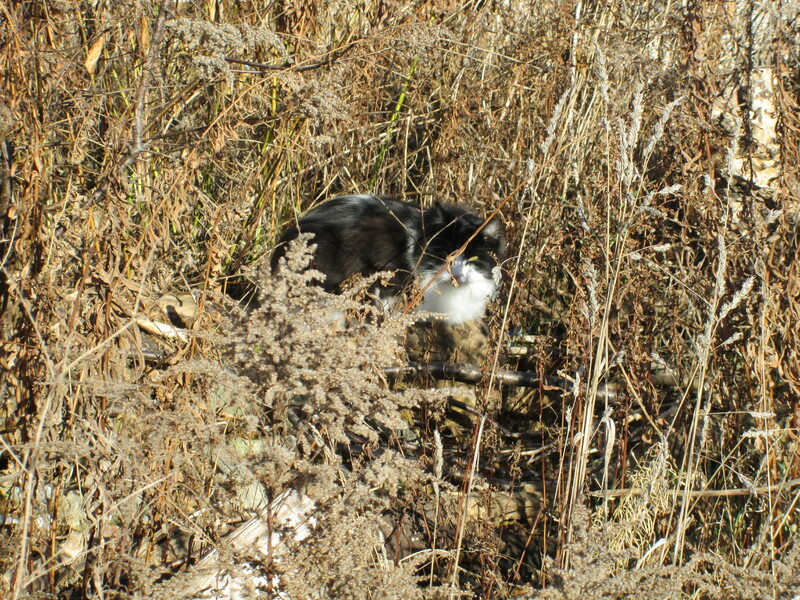 Normally a nocturnal hunter, this specimen appeared to be quite comfortable as long as he could keep a distance between us. A hundred years ago Pellatt and his friends might have been out with their fox-hounds chasing this guy’s ancestors. 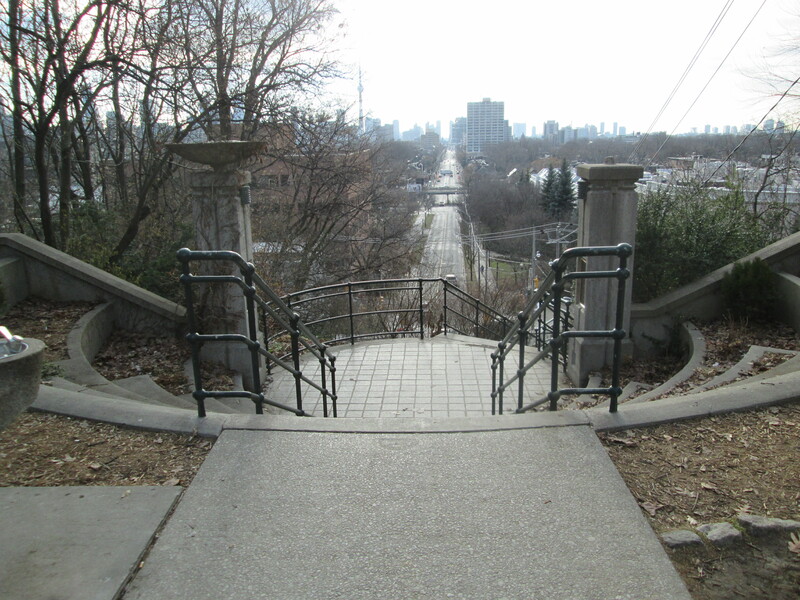 This entry was posted in Castlefrank Brook, Don River and tagged Baldwin Steps, Casa Loma, Castlefrank Brook, Nordheimer Ravine, Red Fox, Spadina House, St Clair Reservoir on December 27, 2014 by hikingthegta. It was minus 5 with almost no breeze. The Canadian flag reflected on the creek in the cover photo hangs almost motionless. With the sun shining it made for beautiful day to mark the end of fall. Returning to the parking lot at Jeff Healey park we set out heading south to see what we could see. 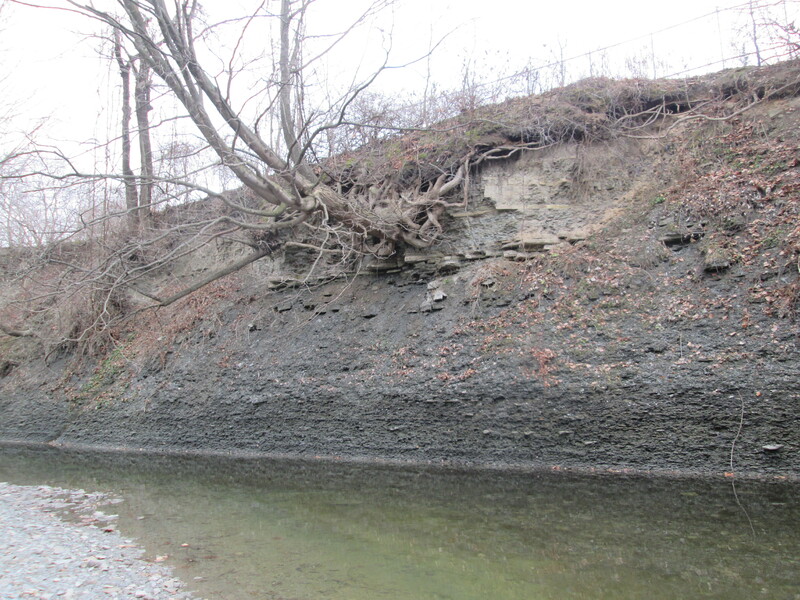 Steep shale embankments on the west side of Mimico Creek forced us to cross to the east side. 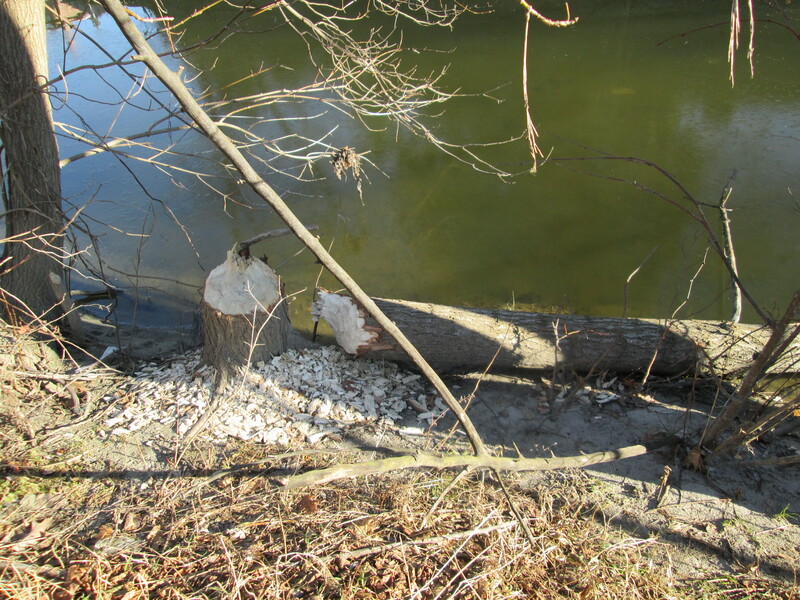 It wasn’t too long before we began to see a lot of trees that had recently been chewed off by beavers. Beavers have strong jaws for cutting down trees and can bite through a 1.5 cm tree in a single bite. Larger trees, like the one in the picture below, are not used for construction of lodges or dams. Their bark is used for food and the upper branches are taken for building materials. The beavers have started to build a dam across the creek. Left on their own they will continue to build their dam higher as they raise the water level in the creek. The dam is strengthened with mud and stone that is dug up off the bottom of the creek with their tails. Beavers like to build a lodge which they use as a home for the winter. The entrance to the home will be from under the water but the home will eventually be built up to have room above the water to make a dry comfy home. This one is currently under construction. 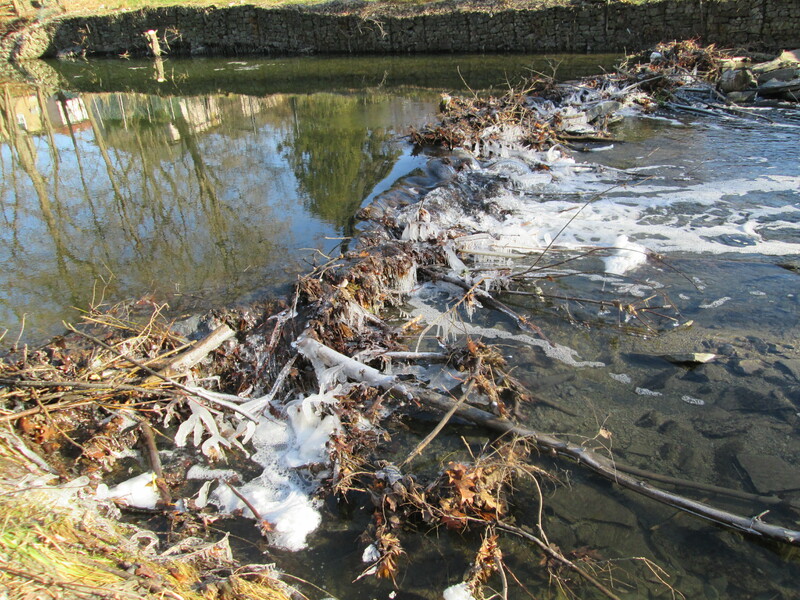 The beavers will raise the water level to close to a meter above the lodge entrance to keep it clear of ice during winter. Along the creek bed a lot of old building materials have been dumped. The Port Credit brick in the picture below is like one described in Middle Road Bridge on Aug. 16th from a brickyard that closed in 1920. The J. 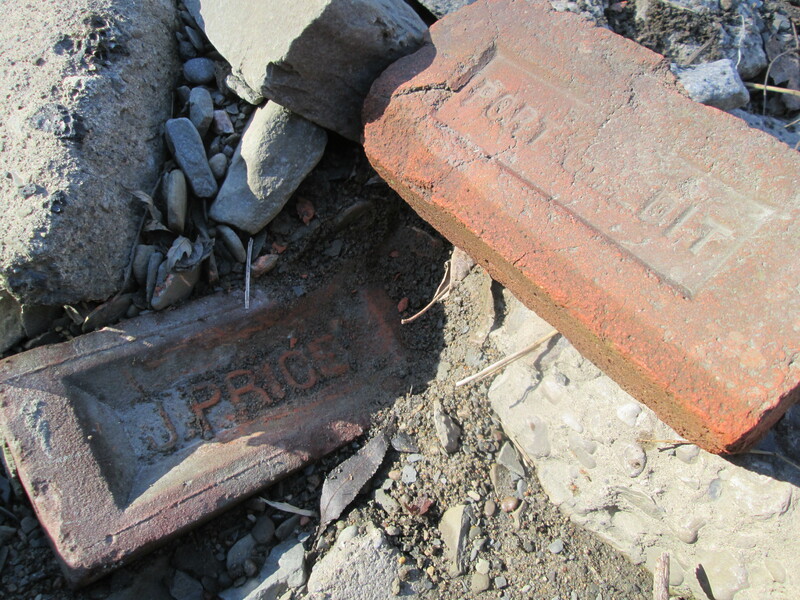 Price brick is from a brickyard that operated on Greenwood Avenue in Scarborough from 1912 to 1962. Greenwood Avenue ran along a seam of clay which made it home to several brick makers during the 1900’s. John Price ran his brick yards producing a soft mud brick which is used for residential construction. The term “John Price Brick” is still used generically to refer to this type of brick. When the Price brickyards closed in 1962 the soft mud press was moved to the Don Valley Brick Works. 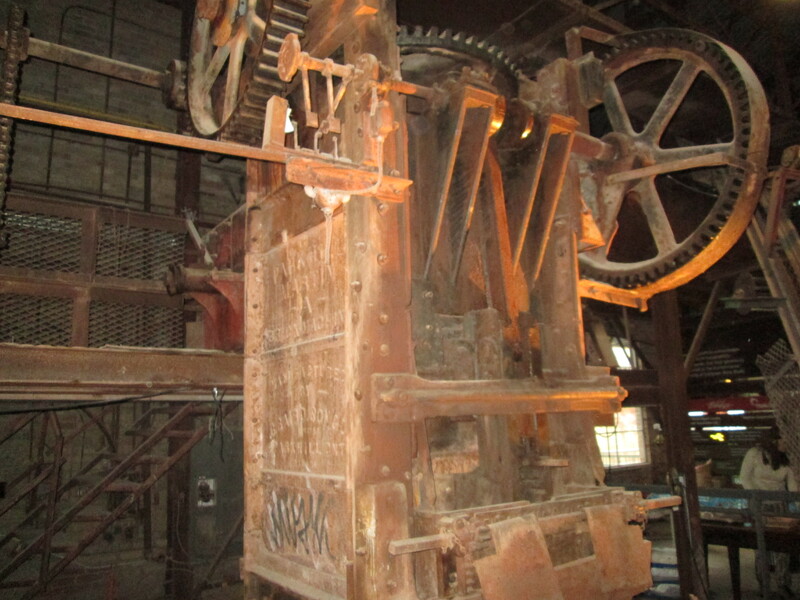 The picture below shows Price’s soft mud brick press as photographed during an excursion to the Brick Works on Nov. 16th. A little farther along we found an old beer bottle. The stubby, as it was affectionately known, was introduced to Canadian beer drinkers in 1961. Market research showed that women drank less beer than men and it was thought that making the bottle skinnier would appeal more to that untapped market. By the mid 1980’s all the stubbies had been eliminated in favour of the American style long neck bottle. The picture below shows a 1977 stubby. 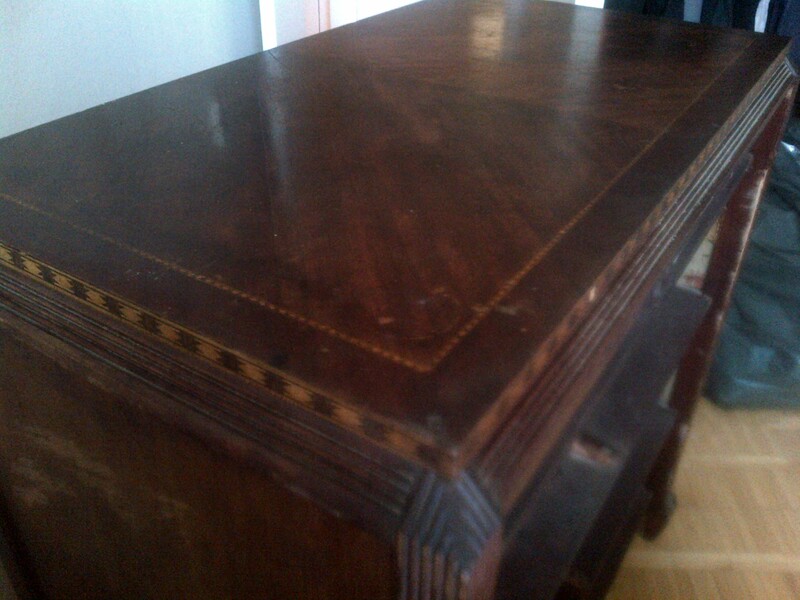 This is what it may have looked like when it was new. 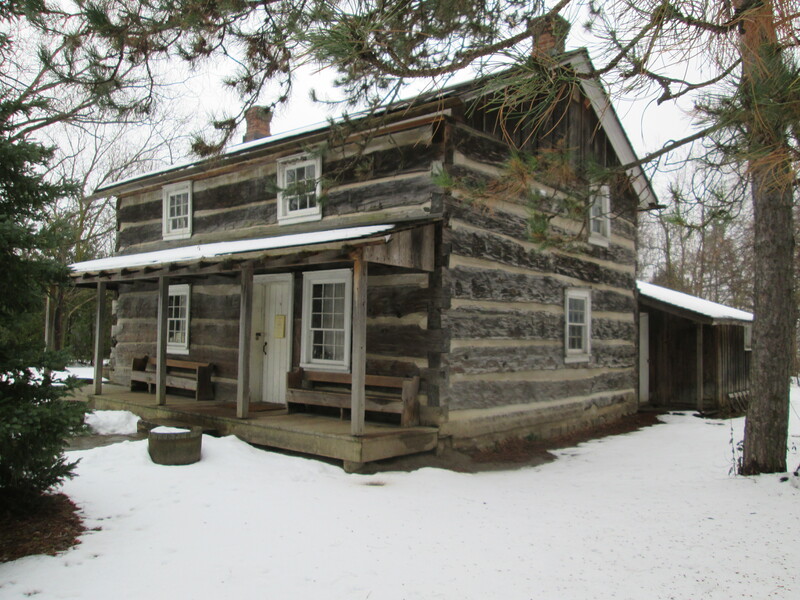 William Gamble built a saw mill on the Mimico Creek on the west side near the railway crossing. It is likely that it was located on the land that can be seen upstream, framed by the rail bridge. Gamble also owned the King’s Mill before it was destroyed by fire in 1881. Today we know that restored mill as The Old Mill. 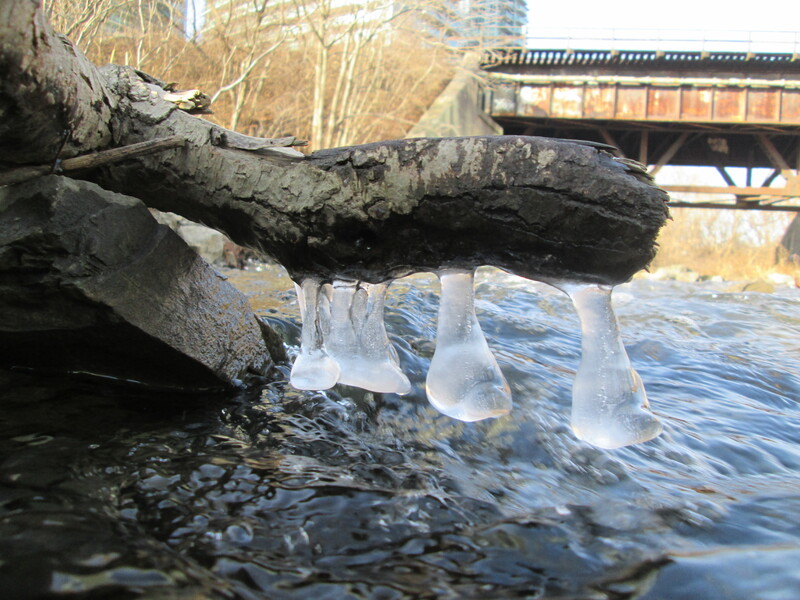 The creek had been splashing on this branch creating it’s own form of Christmas decorations. 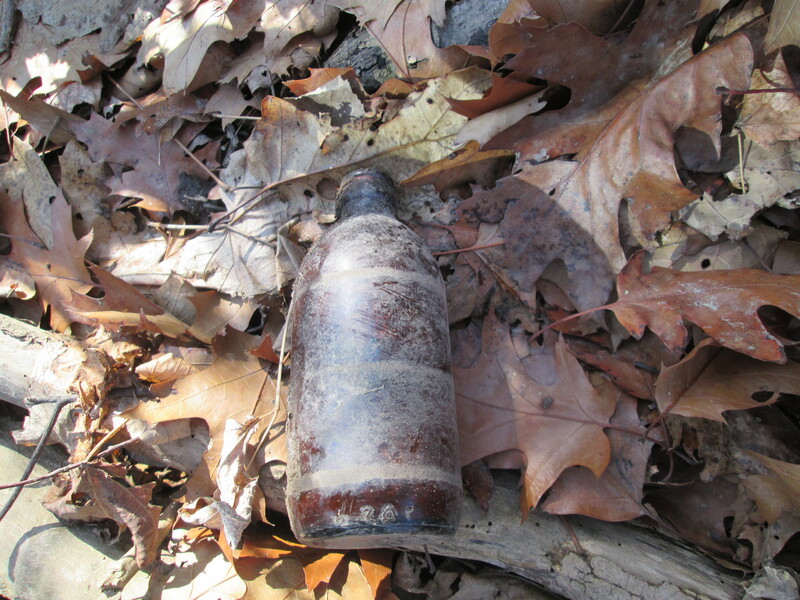 We found a couple of records of past lives along the creek bed. Below is a perfectly preserved shell from when this area was the bottom of Lake Iroquois. Davenport Road marks the approximate shoreline of this ancient inland lake. The past life recorded on this piece of rock is from a much more recent era. However, it is only possible to make out that the last 4 letters on the first line say “wood” while the second line ends with “sons”. 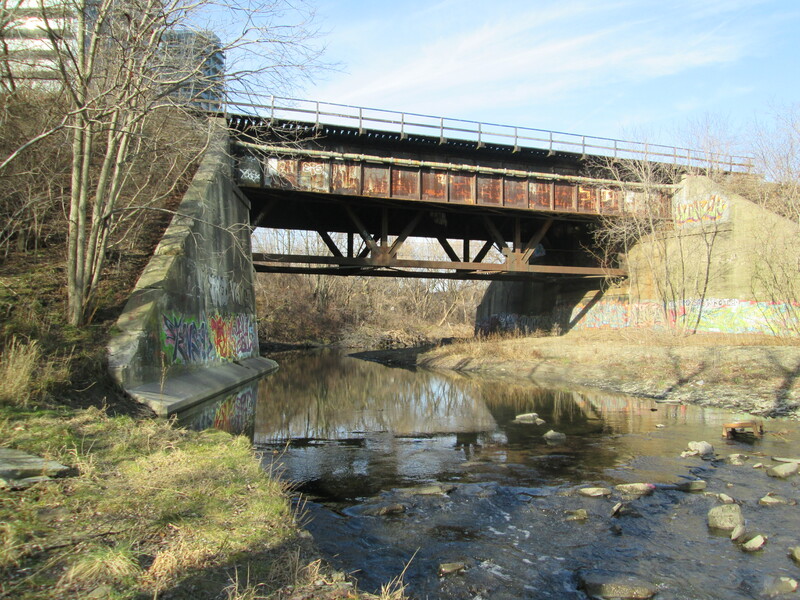 In 1997 the first single rib inclined arch bridge in North America was built across the Mimico creek near the mouth. The creek is 90 meters wide at this point but was reduced to 44 meters to keep construction costs down. The bridge deck was also reduced to just 2.5 meters to keep the project on it’s $650,000 budget. The narrowing of the creek provided wetlands around the bridge attracting wild life to the area. 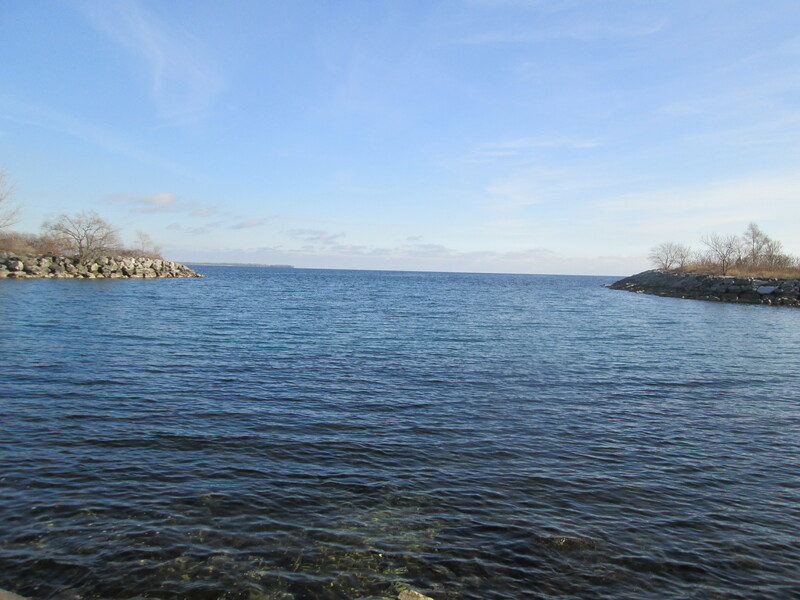 Where Mimico Creek empties into Lake Ontario is protected by a in-filling. The shoreline has been altered to create a safe harbour for boat launches. 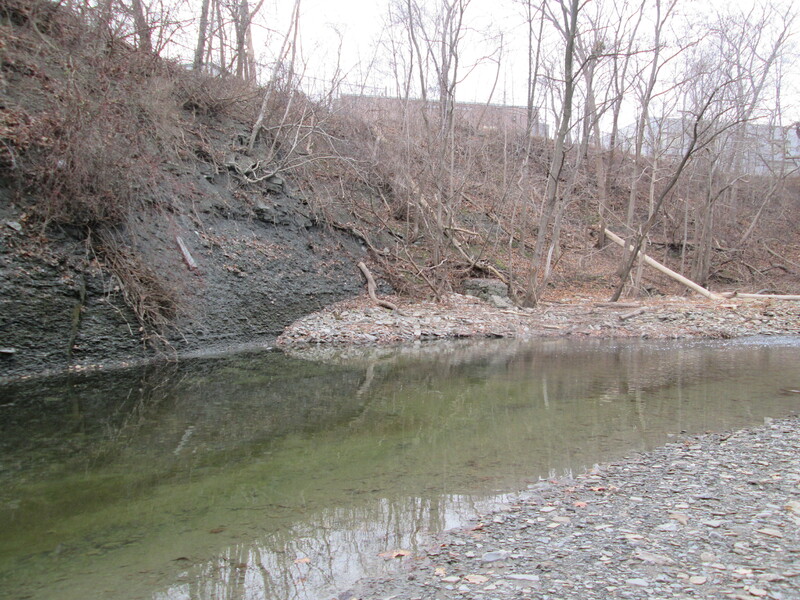 An earlier boat launch on the west side of the creek has been replaced with a new one in the sheltered cove. On the horizon near the left side of the picture, way off in the distance, is a large ship. Visit us at http://www.facebook.com/hikingthegta for a gallery of unpublished pictures. 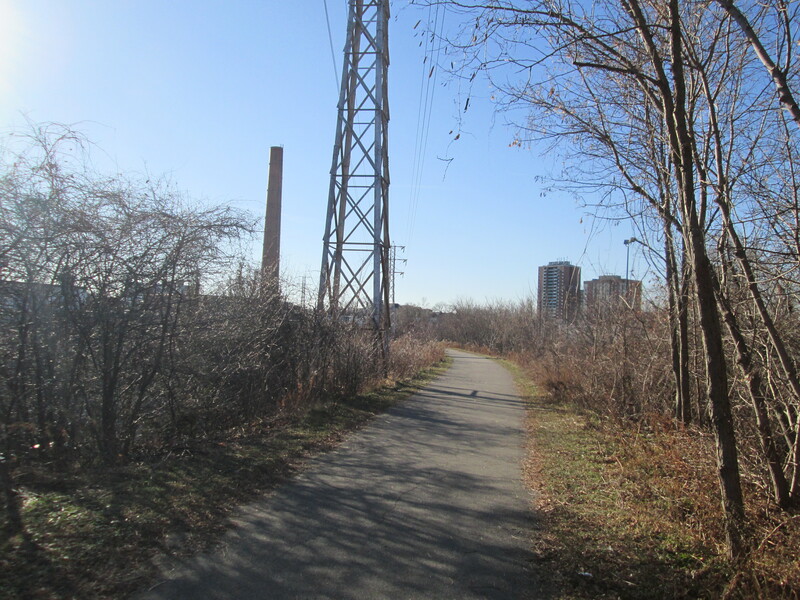 This entry was posted in Mimico Creek and tagged Beaver Dam, Beaver Lodge, John Price Brickyards, Mimico Creek Bridge, William Gamble on December 23, 2014 by hikingthegta. It was a cloudy day, threatening sunshine, and just around the freezing mark. We parked in Jeff Healey Park on Mimico Creek. Jeff Healey was a blind Canadian Jazz/Rock guitarist and singer. 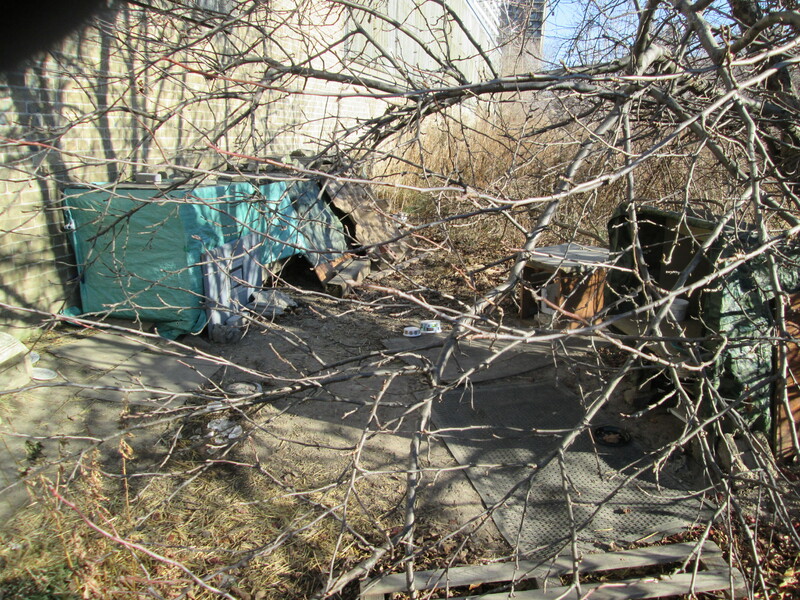 Jeff grew up on Bonnyview dr. just across from Woodford Park where he liked to toboggan in the winter. After his death to cancer in 2008 the city renamed the park in his honour. Efforts are currently underway to redevelop the park into a disabilities friendly park which will include large scale musical instruments for the local children to jam together on. The name Mimico comes from the Ojibwe word that means “pigeon”. The passenger pigeon, after which the area is named, was considered to be the most numerous species in the world at the time that Europeans came to North America. Today they are extinct. 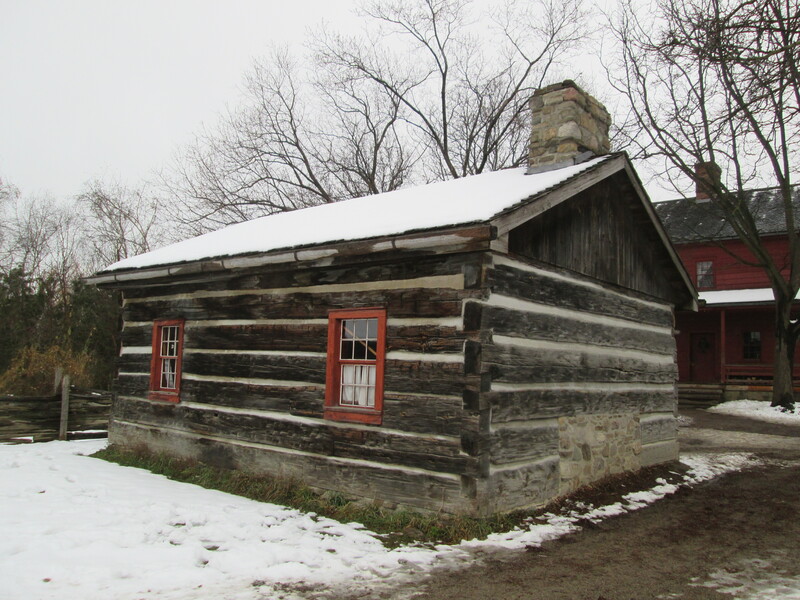 William Gamble, who later operated the King’s Mill (now Old Mill), opened a saw mill on Mimico Creek, giving rise to the town of Mimico. It was initially comprised of three estates or land grants. We started off on the west side of Mimico Creek. Mimico creek is cut through layers of shale. 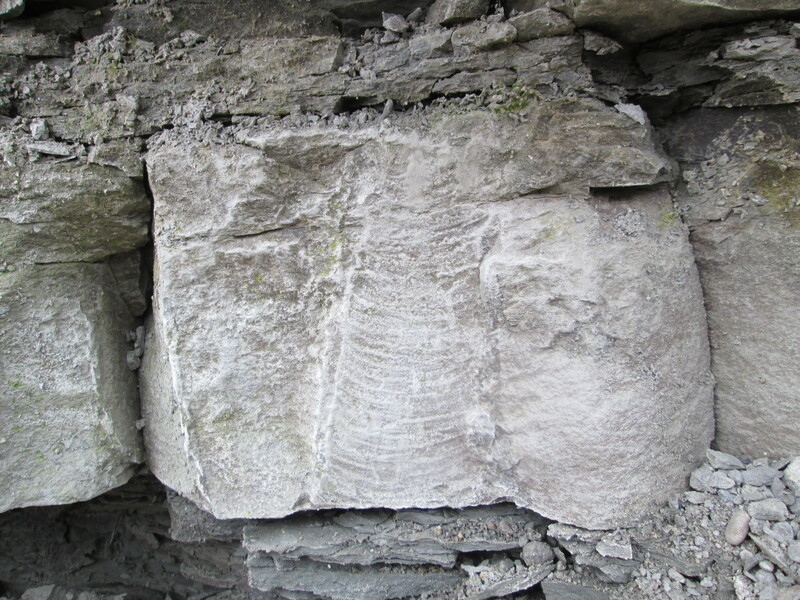 This shale is full of fossils and we found the fossil plant in the picture below. 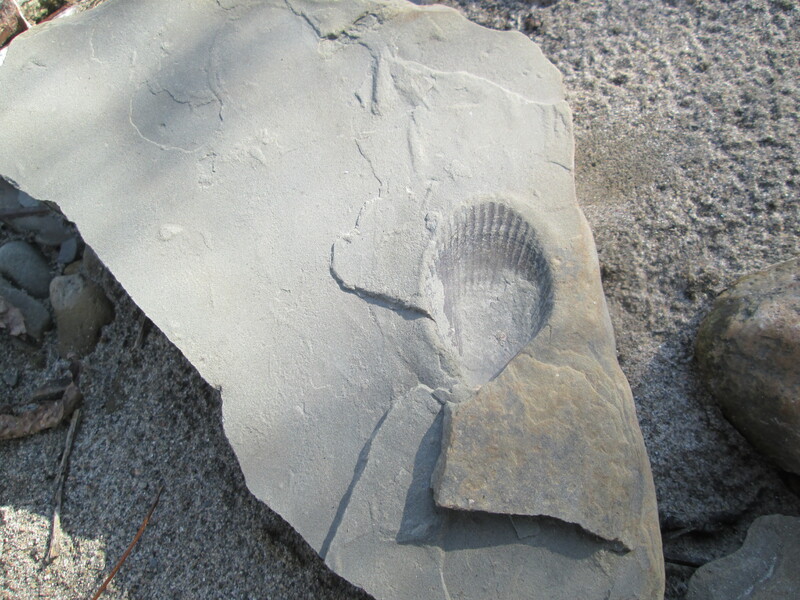 This fossil is standing up and passes through several layers of shale deposits. This is known as a polystyrate fossil. This makes it appear to have been lucky enough to stand up for thousands of years without rotting while the rock formed around it. We crossed the creek on a series of stepping stones. A bush of large oak trees grows along the east side of the creek just north of here. Both white oak and red oak grow in abundance. The red oak in the picture below was split into two main trunks as were most of the local examples. A hole in one of the trunks has been taken over for a home by some lucky squirrel. 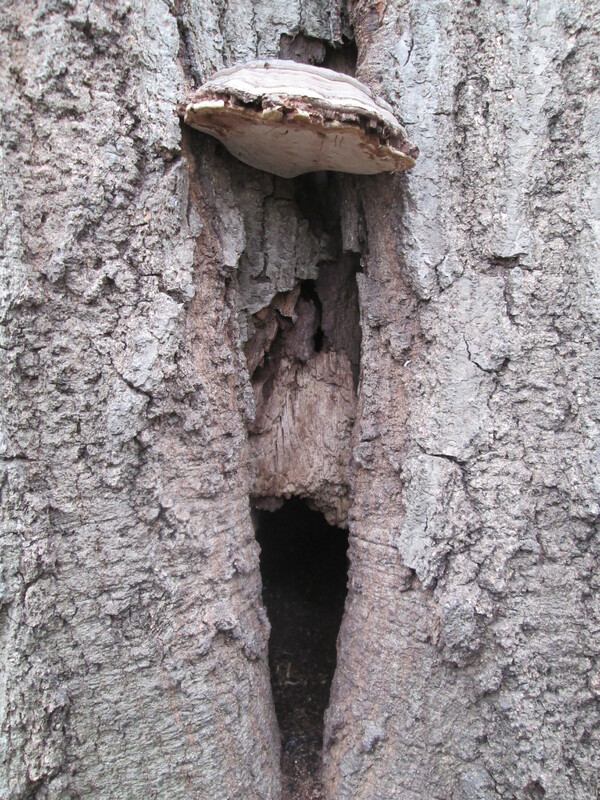 A large fungus provides an awning over his doorway. On Sept. 6th when we visited Riverside Park in Streetsville we described the Goldenrod Gall Fly and it’s life cycle. 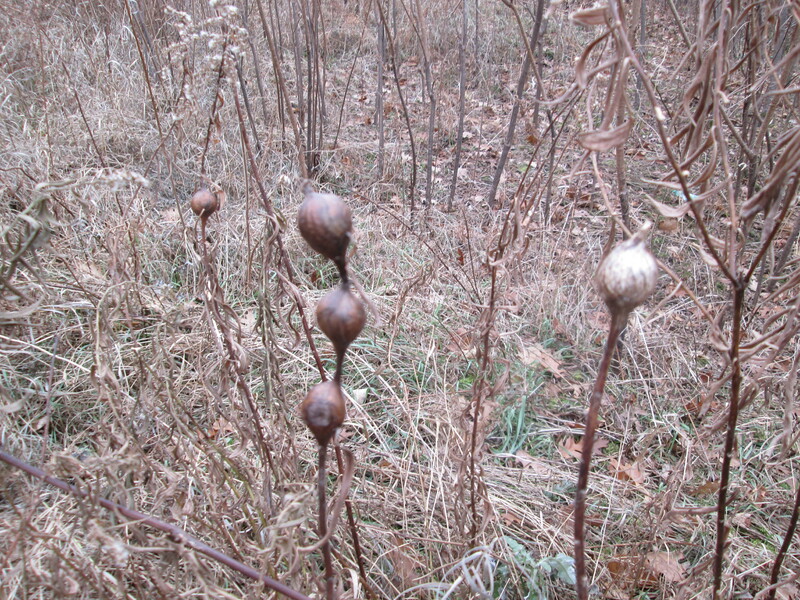 Finding two goldenrod galls on the same plant stem is rare but the picture below shows an even more rare triple gall. One of these plants was broken down and so we investigated the gall on it. 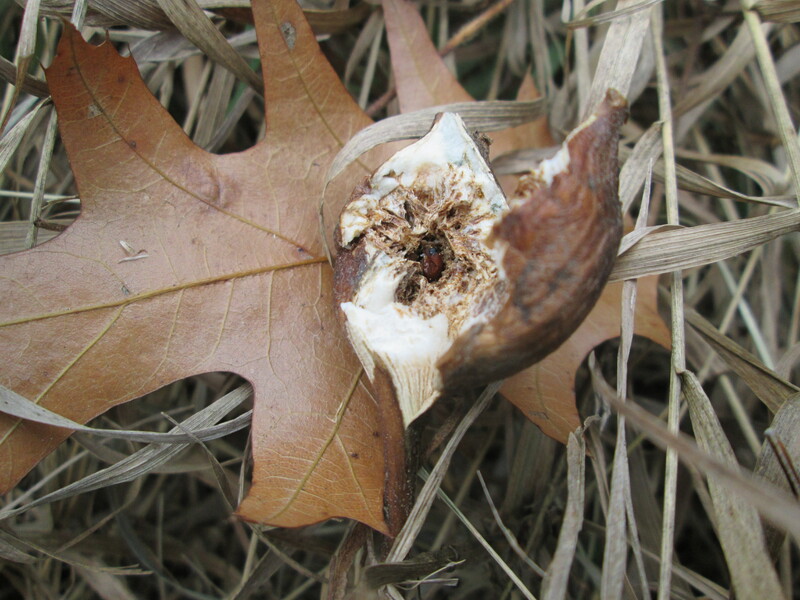 Just before winter the gall fly chews an escape route for the following spring. This leaves a soft spot on the outside where the gall is chewed almost to the outer skin. Breaking the damaged one open revealed the little insect inside. Mimico Creek appears calm and perfectly clear today. When it floods it races down the creek valley carrying rocks and trees with it. Along the west shale bank the creek has thrown up a three foot high wall of stones. It can be seen as the whiter rock just above the water line. 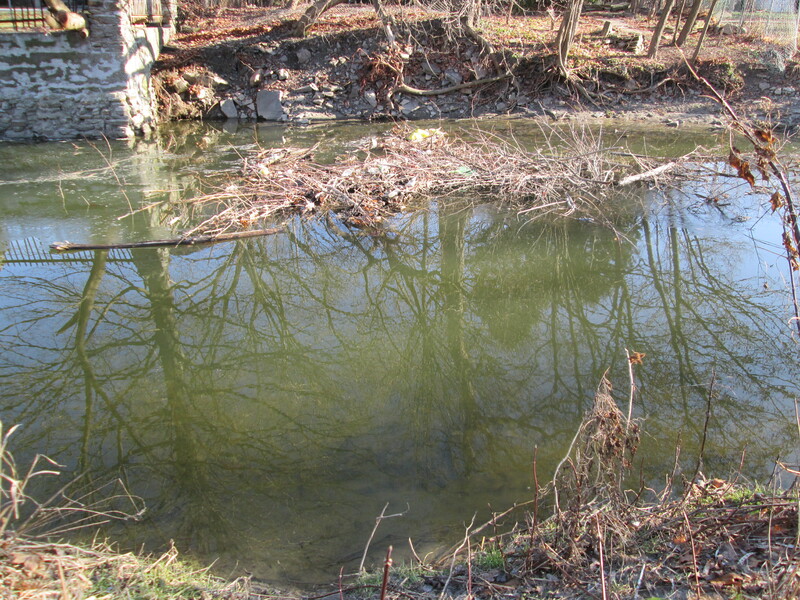 The cover photo shows a picture of the creek at a point north of here where there has been an old dam or flood control built in the creek. 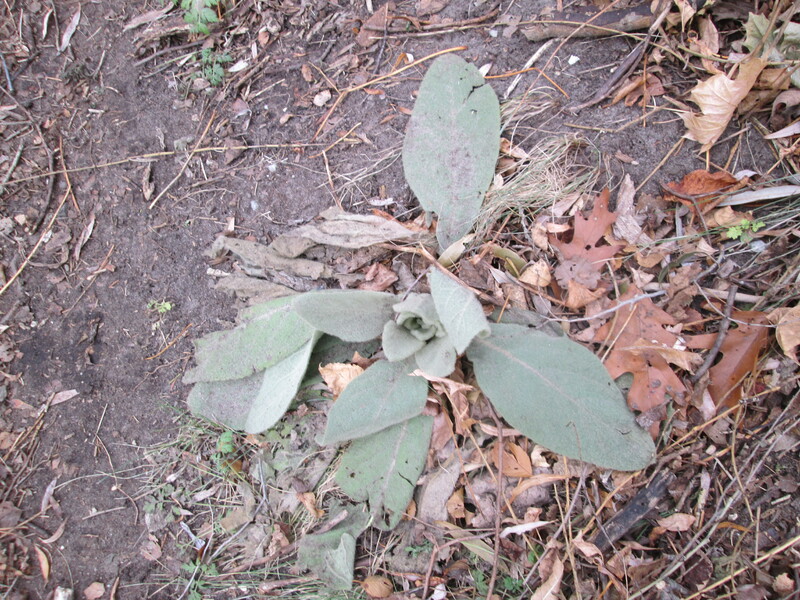 Common Mullein is a biennial plant, meaning that it takes two years to mature. 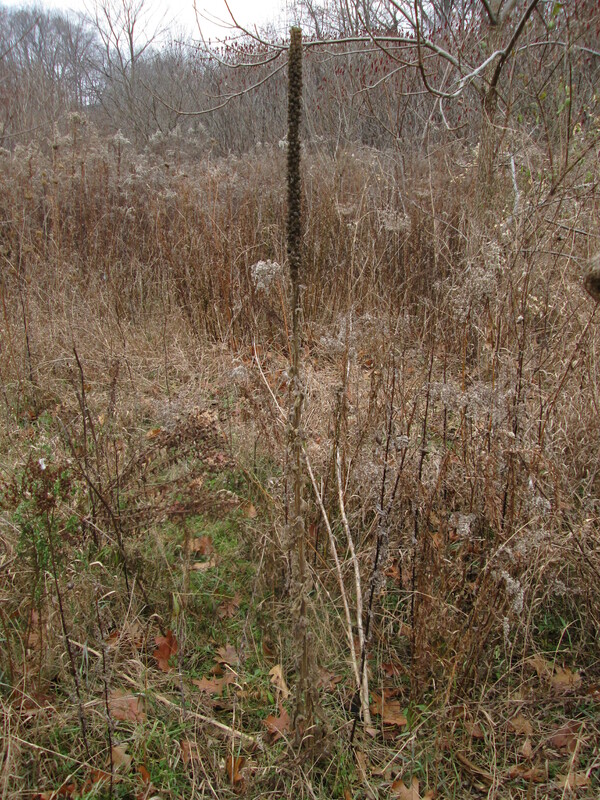 The tall thin stalks stand out among the other field plants. The stalks contain a core that is light and dry and perfect for tinder to start a fire in an emergency situation. Even in the rain or winter snows the insides of these plants can provide a dry source of fire starter. The stalk is often used as a hand drill to create friction to start a fire with. This is a first year common mullein. The leaves are soft and pliable, rounded at the ends and fuzzy. These leaves are unique and no other plant in Ontario has similar leaves. Life is tenacious as this tree bears witness. 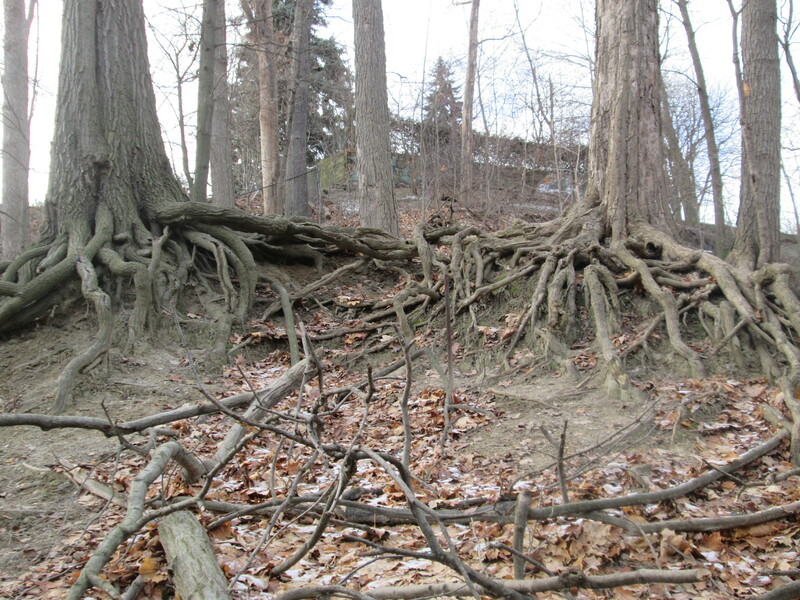 It clings to the side of the shale embankment by a massive system of roots. A brick factory was founded in Cooksville in 1912 under the name of the National Brick Company. After changing names several times it became Domtar (Shale Division) in 1953. 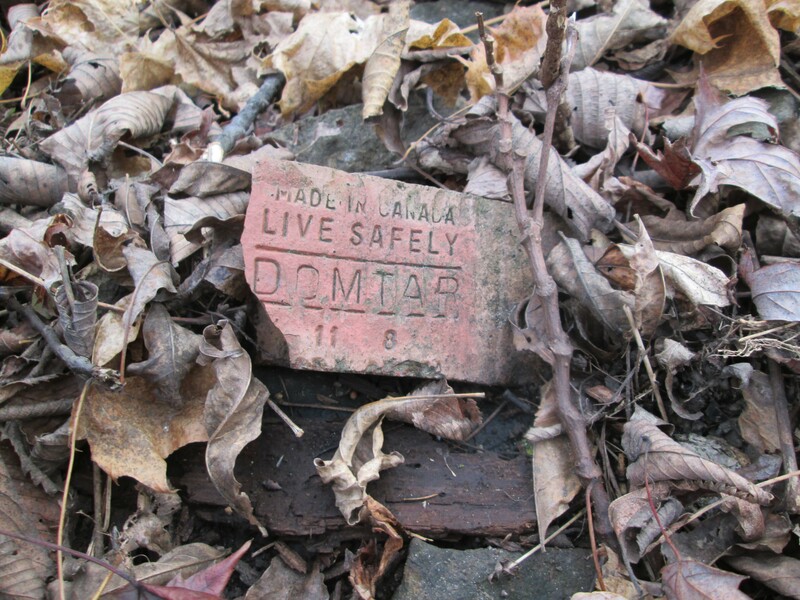 The site was closed down in 1991 but produced a brick that became known as Canada Brick. Along the side of the creek we found a sample. 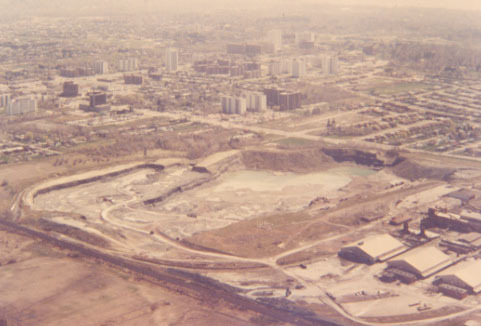 The brick works as it appeared in 1983 at the north east corner of Dundas Street and Mavis Road in Mississauga. Filled in, the site is now home to a Home Depot, grocery store and townhouse development. 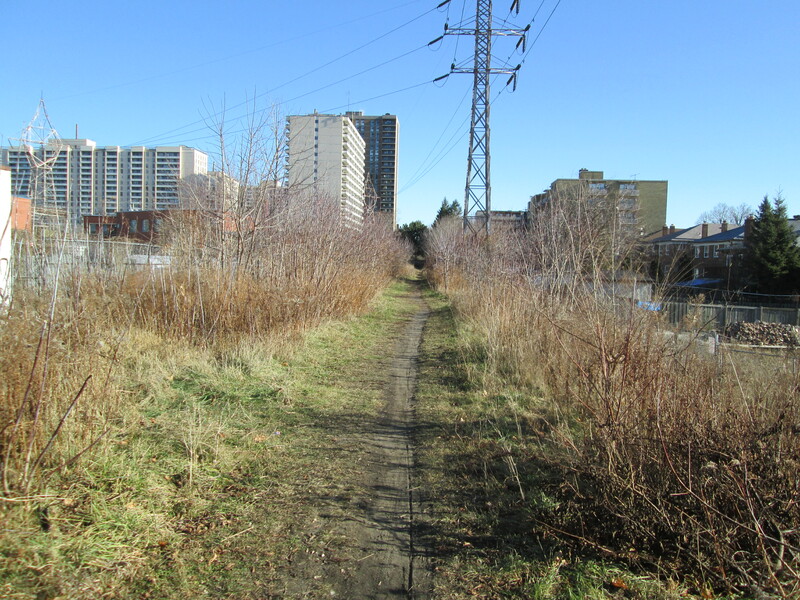 This entry was posted in Mimico Creek and tagged Common Mullein, Domtar Brick Mavis Road, Goldenrod Gall Fly, Polytyrate Fossil on December 7, 2014 by hikingthegta.